There is one Victory beer I particularly like which is the Hop Devil IPA. Cool Label, good beer with tons of hops. When I saw this in my Local beer Store, I was surprised. 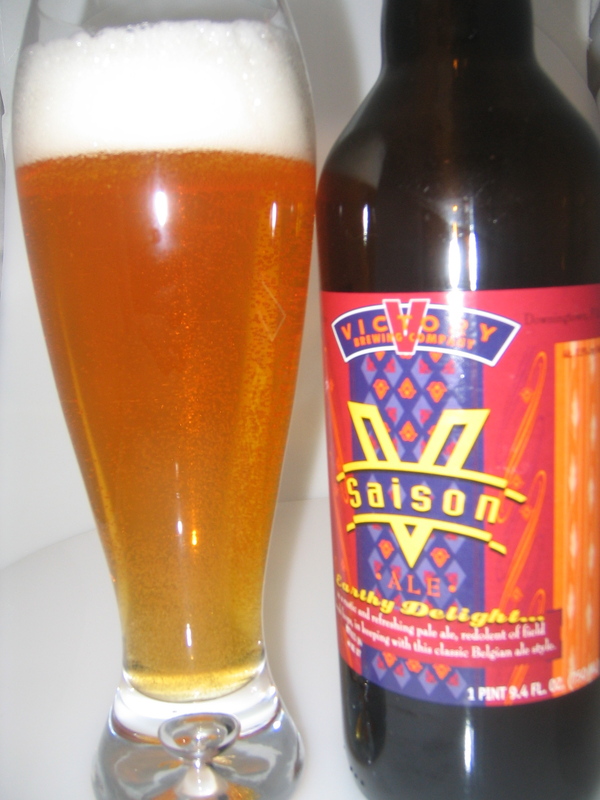 I didn’t know Victory was making corked Saison style ale in a 750ml bottle, so I had to get it. As with most Saisons, this highly carbonated beer requires a slow and delicate pour, but be sure to leave some room for the head. Light and clear blond ale with lots of bubbles, typical for the style of beer. A clean thick white head, which lasted the entire pint. The last glass had a ton of sediment; so if you don’t like the sediment, leave a bit at the bottom. This Saison was a bready sweet citrus aroma with a mild hop presence. A nice light crisp lemony citrus sweet beer. The lemony sweet was nicely balanced with mild hop bitterness and a good long lasting finish. Nice refreshing beer, crisp, full of flavor. Take a small sip and let the beer roll around in your mouth, this beer has such nice flavors. Thanks for the nice review. We often talk of lemon and pepper in the flavor of this one. Quite spicy and refreshing with its 4 European hops. You do mean HopDevil Ale, not Hop Head, right? Moderator: Yes, Hop devil. I corrected the review.